When the air gets crisp and it's chilly in the morning, my thoughts turn to jackets. I'm not really a coat maker but a cute jacket is right up my alley. I knew I wanted to add it to my collection. But me being me, I was going all in to get the look I saw in my head. There are loads of photos and information in this post. So if you're not interested in the design and construction information, skip down to the photos and conclusion to see the finished jacket. Let me state that this pattern only goes up to an XL with a bust measurement of 46" and waist of 48". There's no hip measurement on the outside of the pattern envelope...but when I measured the pattern pieces it was 58" before the seam allowances were taken off. I knew I would have to alter the main pattern pieces to fit around my hips. I made my alterations to the front and back piece...in the sides between the large and extra large cutting lines...slashing and spreading so that I ended up with 1.5" at the hemline on each side. Besides the side alterations for the back piece, I also did a pivot and slide of 2" on the fabric prior to cutting it out. There was no need to make an adjustment to the sleeve pattern because it was wide enough. It means that my version won't have the loose sleeve look of the pattern envelope but I'm good with that. The final pattern alteration was regarding the front facing piece. Brittany mentioned it in her review so I knew to look out for the issue. To solve the problem, I drafted a back neck facing. so that the collar would be enclosed in facings which means I did NOT apply it as the pattern states. Then I omitted the back yoke. Yeap, went my own way. It's a stretch denim jacket and I thought it just didn't need it. One of my reasons was the weight of the denim and some of it was the look I wanted. This is what my collar looks like with the front facing. I acknowledge that I went overboard with my design changes. I threw everything into this jacket except for the kitchen sink. I may not have hacked the pattern much but I did hack the design! My first thought when I saw the pattern was to add some O rings to the flaps. I saw this on a dress on Monica's Instagram account and I really liked the look. I'd been waiting for a garment to add that O ring accent to. I thought this jacket was perfect for it. So I added the rings to all of the pockets. The second design change I made was to use leftover shirting materials from this shirt for my facings, under flaps and the shoulder tabs. The third change was to add binding everywhere to give this very busy print boundaries. So it was added to the collar, inserted into the sleeve band hems and down the front of the jacket. I also used it to bind the seams and hemline of the jacket. The last thing was a "by chance" thing. I ordered some new labels from Dutch Label Shop. I wanted a label that better reflected where I am now in my creative journey. This label is designed to look like my blog header. After I sewed it onto the upper pocket flap, I thought it was perfect. While I really like my design changes, they added considerable sewing time to this make...considerable time! I read the pattern instructions and then proceeded to sew the jacket in the order I wanted after the basic assembly was done. Most of my construction changes were sewn with the pieces flat. - I basted the sides together to check fit ~ once I realized the fit was okay ~ took it apart and added the pocket flaps. I didn't want to do all of the extra work for the pockets if the jacket didn't fit. - One of the suggestions that the pattern makes is adding twill tabs to the pocket flaps. The O rings were my design decision although I don't think they stand out as much as I thought they would. - Binding isn't suggested in the pattern instructions. That was all me trying to contain the fabric print a little. I'm glad I added it and used a hong kong type of finishing to attach it. However, adding it to the front really defined the button area and gave more definition to the jacket front. - There's a lot of topstitching on ERRYTHING! From the tabs on the shoulders to the sleeves and hems. Everything is topstitched. - The cuffs were way too large on my jacket. So I did my normal trick of making a pleat and adding a button. 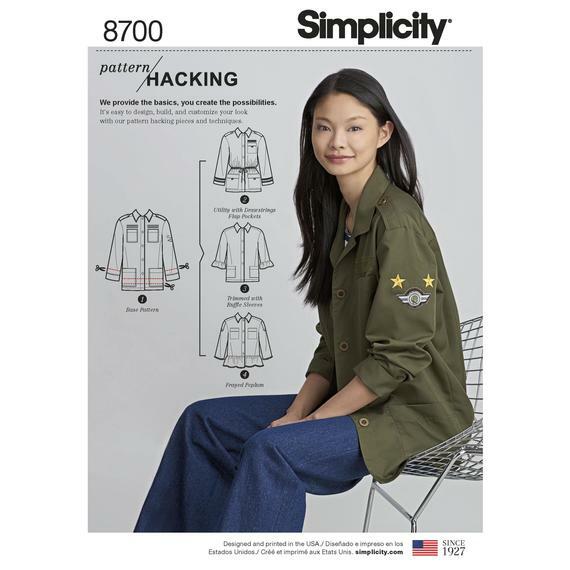 This is one of Simplicity's "Pattern Hacking" patterns so it comes with several options to make the jacket. You can make it as simple as possible or you can go full in and add everything the pattern suggests and then a few of your own designs. As explained above, I went all in. LOL! You would have thought that I'd have been realistic about the amount of time it would take to sew this jacket especially since I put every design detail into it. But no...about halfway through the construction I got annoyed! *LOL* When I finally thought about it I realized that it takes time to get a more detailed garment made. I needed the time to bring to fruition all the things I saw in my head. When I understood that the sewing became more enjoyable. Does this happen to anyone else? Just wondering if I'm standing on this creative cliff alone? One other thing happened after I took the photos. My Mother saw me standing in the kitchen with the jacket on and asked where I bought it. I think that's the ultimate sewists compliment! The first shirt from the border print series is up next on the blog. That is one fancy jacket. I like everything about it and I would love to have that fabric. You did an amazing job with this jacket Carolyn.I love all of your embellshiments! What a wonderful jacket! I can certainly relate to the frustration of working through all the details of a design, but it's those details that really add the "icing" to the garment. Irene - you are so right about the added details. I think I get almost done, can see the finish line and then start to feel bogged down. I'm glad its done though especially since it's sooooo cold here now. Hi Carolyn. That jacket has an elegant vibe. I could see it all dressed up too. I agree with your Mom! You did a excellent job. Perfect timing with your post with your details as that pattern is on my cutting table waiting to be cut out. Thank you for taking the time to document for us. JB - I'm thrilled that you're making your own version right now too! Hope some of my documentation helps you with making yours. Thanks for the compliment! Your jacket is fantastic. The trim and label just make it perfect. Perfect jacket. It is beautiful! I didn't think much of that pattern when I first saw it, but I was soo wrong. I love yours, all the styling you did on it is just amazing. I'll look for that pattern next time they're on sale. Great job!!! Joyce - it's a great pattern with a lot of potential. I have ideas for 2 more - just have to see if I can get them made before the winter is over! So many patterns - so little sewing time. You did a really amazing job with this jacket. Your effort and time invested really shows. I've learned that, for me anyway, the extra time and effort really shows in the final product and in my mind is so worth it. It's those garments that give me the most satisfaction while making them and the most compliments after. I think we all start with a bit of the how much and how fast can I sew routine but as time goes on it evolves into an even more satisfying journey as we branch out with new more challenging efforts. Thanks Bunny - that's high praise coming from you! You are one of the sewists who's sewing I try to emulate since it's so skilled. This definitely wasn't a fast sew but now that I have a wardrobe of me-mades to wear, I'm slowing down and adding more detail to my makes. Thank you for your kind comment! Thank you, thank you, thank you! This looks great! Love the o-rings. They are perfect for this jacket. The jacket as sewn and styled on the pattern envelope has military vibe. Yours pays homage to that vibe, but takes it to a more sophisticated level. And your label where a military uniform jacket would have a name patch is inspired! Perfect! I bought a very large plaid - I mean HUGE - at Fabric Mart, and have been looking for a very plain shirt jacket pattern for it. I envision a sort of fifties-style jacket, with lower patch pockets (if I can figure out the plaid matching) and maybe with a strip of elastic on the center back waist to bring in some of the volume. I looked at this pattern, but the yoke scared me off. 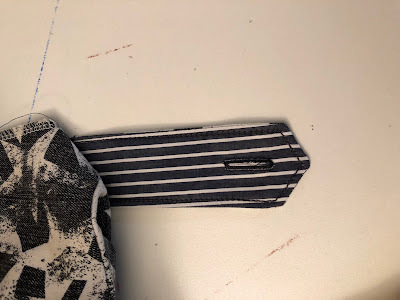 Did you just overlap the seam lines to make yours yoke-less? And is the button band cut on or a separate piece? I'm nervous about plaid matching, so I may use faux suede for the collar and front band. As so often happens, your sewing and, especially, your styling are an inspiration. Kay - my jacket has a yoke. It's just invisible in the print but it's easy to sew together. The button band is made by me using the bias binding. I needed some more definition on the front to contain that very busy print. The pattern doesn't have a button band and it would be perfect for a large plaid. Cut the yoke on the diagonal since the back is cut on the fold and the two front pieces are solid. This pattern would work well for your fabric. Great design decision about the binding! And I love your way of describing it: "to give the busy pattern boundaries". It is a design strategy that I have been trying to use more and it helps gel my thinking to have the words. Thanks! Re: time spent sewing detailed patterns/designs - my big breakthrough came when I focused on how much I like the PROCESS of sewing. For me, strangely enough, at least as much as the wearing of the garment. So, more time in process = more pleasure. Looking forward to the border print, another passion of mine, too. Silvermom - well I didn't have to Hong Kong finish all of those seams but the result was so worth it that I just kept going. It is one of the things I like most about the finished jacket. Glad to provide words that bring a concept to life for you! Cute jacket. I like all your design details especially the O-rings and the binding on the front to highlight the button area. Those are my favorite "upgrades" that you did. Extra special things take time so I hope you get lots of extra chances to wear it. I love your binding and O ring details. And cute hair style too. I am in awe of all the changes/additions/alterations/improvisations you incorporated into your jacket. You sew like I would like to but have not yet bolstered my nerve to attempt. Bravo! Your mom nailed it... it is every bit as good as a purchased garment and oh so much more. It turned out so well! It's fun to add all those special touches that really elevate handmade garments. Carolyn, would you please post a list of your online fabric store choices? Great details on this jacket - I can see why this took a lot of time and it is fantastic that you were able to enjoy the process too. beautiful and really love your print. Looks great and love the flip do on you!